Bel canto – literally beautiful singing – is a technical term for a particular singing technique (more info here), but the term is used popularly today to refer, in particular, to the style of operas by, among others, Rossini, Bellini, and Donizetti. All three wrote operas characterized by richness of melody and focused on the sensual pleasure offered by the beautiful sounds of controlled voices, singing with a warm, legato tone, often with intricate embellishment. Donizetti came into the bel canto picture late in its history and is seen as a bridge between bel canto and the heavier dramatic works of Verdi. Lucia di Lammermoor is often cited as his masterpiece, a work with a reasonably cogent plot line and nary a moment that isn’t full of ravishingly beautiful melody, both solo and ensemble. The story has young Lucia in love with Edgardo – secretly, since Edgardo’s family and Lucia’s are on opposing sides of a long feud. Lucia’s brother, Enrico, wants to marry her off for political and economic gain. He deceives her into believing Edgardo is inconstant, so she marries according to his wishes. But Edgardo shows up and, convinced he has been betrayed by Lucia, throws down the ring she gave him. This scene contains the spectacular sextet, in which Edgardo expresses his love confounded by betrayal, Enrico feels guilt for his shabby treatment of his sister, Lucia is miserable beyond tears, and three other principals express their sadness and pity for Lucia. In the third act Donizetti offers one of the great "mad scenes" of opera: Lucia appears before the wedding guests, knife in hand, bloodied – she has lost her mind and murdered her husband on their wedding bed. Her extended coloratura aria, which includes an unparalleled interplay of voice and flute, is a tour de force of singing drama. In the final scene, Edgardo, who was to have dueled with Enrico, learns that Lucia has died and kills himself. San Francisco Opera revived a 1994 production by Gerard Howland, a sad mistake of design then, no better now, and best trashed before used again. Its sole distinguishing element is a heavily skewed view of the castle seen from the perspective of someone lying on the ground in a courtyard and looking up, suggesting that the castle is an uncomfortably confined space, in which, of course, our heroine is trapped. Not a very profound point for such an aggressively vertiginous visual assault. This was an evening, however, of some fine singing. Ruth Ann Swenson, after missing most of her scheduled San Francisco performances due to illness, seemed completely recovered and delivered a stunningly controlled performance, bell-like tonality, and sympathetic character development. 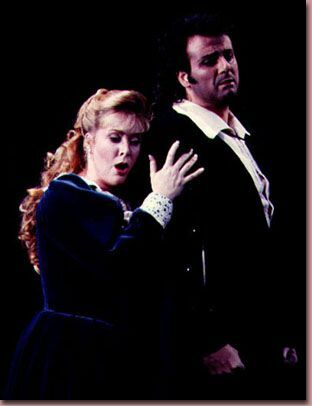 Tenor Ramon Vargas was a dashing Edgardo, emotionally intense and offering fine ringing high notes not heard often in San Francisco of late. A genuinely distinguished performance came from bass-baritone John Relyea as Raimondo, the chaplain, impressive both vocally and dramatically. The drawback was the Enrico of Christopher Robertson. Much of the time Mr. Robertson seemed somewhat lost on the stage; his voice seemed to run out of steam before the end of the first act and he appeared to get little support from veteran conductor Richard Bonynge, who seemed only rarely during the evening even to look at his singers. The positives far outweighed the drawbacks in this performance, however. A superb mad scene and a brilliant sextet, especially, provided transcendent moments as only grand opera can.